I'm not going to beat around the bush. I'm not gonna sugarcoat anything. I am simply going to get straight to the point and tell ya like it is. You need this oatmeal in your life. Seriously. Like, if I could convince you to make only one recipe from my blog, I think it would be this one. 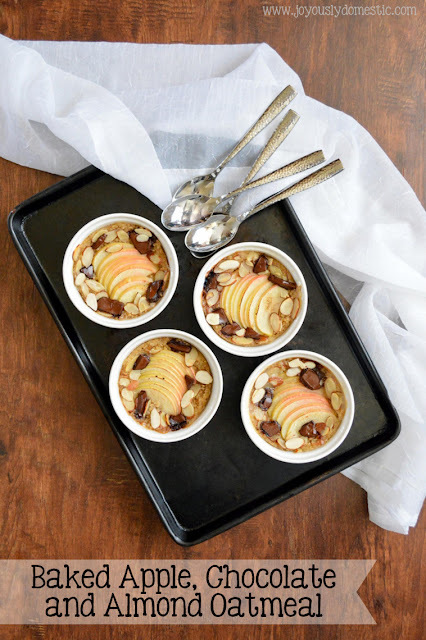 Baked oatmeal - done right - can be life-changing. It may not be fancy. It may not look like much. Heck, I'm sure you're thinking that I am crazy getting all coo-coo over oatmeal. But, there are just so many reasons why baked oatmeal rules. It's an incredibly, insanely inexpensive recipe to make. It is healthful and filling. It's an awesome dish to feed a crowd if you happen to have guests in town or friends over for brunch. The possibilities to flavor it and change it up to suit your fancy are endless. If you're making it for only one or two people initially, you'll have leftovers (which means you can have breakfast ready to pop in the microwave throughout the week). And, most importantly - it takes almost ZERO time of hands-on work. This particular recipe calls for steel cut oats, so make sure you are not using rolled oats. The recipe requires that you soak the oats overnight in water so that they cook up quicker in the morning. So, don't forget that step. And, I really encourage you to try using a dark chocolate infused with chili (THIS is my favorite) for this recipe. Any type of chocolate should work (probably even chocolate chips), but there's just something magical about the tiny bit of heat that comes from using spicy chocolate in this recipe. Soak the oats in water overnight in a medium bowl. In the morning, preheat oven to 350 degrees. Stir the sugars and salt into the soaked oats. (Do not drain water.) Divide into 4 - 6 greased ramekins (the number needed will depend on the size used) that have been placed on a baking sheet. (There should be enough liquid to just barely cover oats.) Garnish tops with apple slices and almonds. Bake for 20 minutes, then top with some chunks of chocolate (about 5 - 6 small chunks per ramekin). Return to oven and continue baking for another 15 - 20 minutes (or until liquid is absorbed and oats appear cooked to tender). Remove from oven. Serve with a drizzle of heavy cream and additional brown sugar, if desired.